Alicat’s liquid flow controllers and meters offer accurate flow measurement and stable control for water or other liquids, including methanol, iso-propanol, ethanol, ammonia, dimethylether, iso-pentane, thiophene, iso-octane or heptane. All liquid flow instruments include bleed screws for easy removal of air pockets. The LC series of liquid flow controllers features fast-acting proportional valves for control or dispensing applications. For liquid flow measurement without a control valve, choose our L series of fast liquid flow meters, which measure flow, pressure and temperature in real time. Our LB series adds a rechargeable battery for easy audits of liquid flows outside of your lab. Control flow rates as low as 0.01 ccm (10 µlm) directly without the need for pressure control over the fluid headspace. Dispense liquid products over a wide range of flow rates with precise control over the dose amount. Characterize the flow of water through a pump, or of saline fluid through medical tubing. Quantify flow rates during leak testing for cooling systems. Control liquid flow rates up to 10 lpm, or as low as 0.01 ccm, with the fastest control response available in a liquid flow controller. The optional Precision Dispensing Package adds a flow totalizer and control firmware for easy batch processing. Versatile. Control liquid flow rates with NIST-traceable accuracy, or control pressure while monitoring flow. Calibrations are available for water, methanol, iso-propanol, ethanol, ammonia, dimethylether, iso-pentane, thiophene, iso-octane and heptane. Easy to Use. Monitor live readings of process flow, pressure and temperature, or set up new dispensing batches–all from the front display of the liquid controller. Instruments in the standard LC series are also available with an optional “S” configuration (LCS) for use with some corrosive liquids. In the basic configuration, we upgrade the elastomers to FFKM. Some corrosive liquids require 316L stainless steel, and in this case we can upgrade the valve (type PCA) and flow body to 316L for full-scale flow ranges of 500 ccm or less. Alicat’s LC series uses small proportional valves for control at lower liquid flow rates. Controllers operating at 2 ccm or less use high-performance valves for optimal control at these very low flow rates. Alicat’s LCR series uses nearly frictionless Rolamite valves for control at higher liquid flow rates. Alicat’s LCS series for corrosive liquids uses small proportional valves for control at lower liquid flow rates. Controllers operating at 2 ccm or less use high-performance PCA valves for optimal control at these very low flow rates. Some corrosive liquids also require PCA valves to establish a 316L flow path. Alicat’s LCRS series for corrosive liquids uses nearly frictionless Rolamite valves for control at higher liquid flow rates. Control flow rates as low as 0.01 ccm (10 µlm) directly without the need for pressure control over the fluid headspace. Fast-acting valves ensure your flow rate stays where you set it, even as temperature or pressure changes. Dispense liquid products over a wide range of flow rates with the optional Precision Dispensing Package. Rapid valve response accommodates changing flow requirements and short dispensing periods. Digital feedback from PLC or PC allows realtime changes to maintain optimal process conditions. Measure flow rate, line pressure and line temperature simultaneously, all in real time. Add an optional totalizer to track cumulative flow over time. Accurate. Measure water flow rates with NIST-traceable accuracy down to 1/50th of full scale. Alternate calibrations are available for methanol, iso-propanol, ethanol, ammonia, dimethylether, iso-pentane, thiophene, iso-octane and heptane. Easy to Use. As soon as you turn on the flow meter, it’s ready to display live flow, pressure and temperature readings in your choice of engineering units. Connected. 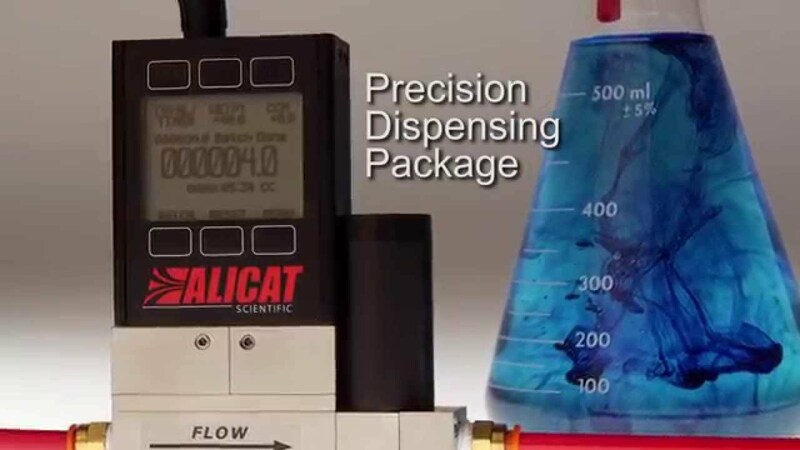 Alicat liquid flow meters feature dual digital and analog communications by default and can be ordered with Ethernet/IP, EtherCAT, DeviceNet, Profibus or Modbus (RTU and TCP/IP) communications for easy integration into your digital industrial or laboratory network. Instruments in the standard L series are also available with an optional “S” configuration (LS) for use with corrosive liquids. In this configuration, we upgrade the flow body 316L stainless steel and the elastomers to FFKM. Alicat’s L series is suitable for use with non-corrosive liquids. Alicat’s LS series is suitable for use with corrosive liquids. Characterize the flow rate of water through a pump, or of saline fluid through medical tubing. The optional flow totalizer makes it easy to quantify the total volume of liquid that has flowed during the test. Alicat’s portable liquid flow meter makes validation or calibration easier by reducing the downtime and disruption to your process. Instant-on and real-time readings for flow rate, line pressure and line temperature let you get in and out quickly. Add an optional totalizer to track cumulative flow over time. Accurate. Calibrate water flow rates with NIST-traceable accuracy down to 1/50th of full scale. Alternate calibrations are available for methanol, iso-propanol, ethanol, ammonia, dimethylether, iso-pentane, thiophene, iso-octane and heptane. Tough. LB series portable liquid flow meters are designed to be carried and can withstand drops if they should occur. Instruments in the standard LB series are also available with an optional “S” configuration (LBS) for use with corrosive liquids. In this configuration, we upgrade the flow body 316L stainless steel and the elastomers to FFKM. Alicat’s LB series is suitable for use with non-corrosive liquids. Alicat’s LBS series is suitable for use with corrosive liquids. Rapidly quantify water flow rates during leak testing for cooling systems anywhere in your facility. See multivariate readings for line flow, pressure and temperature without needing to connect to a computer.